This morning, NPR aired a story on North Carolina’s blueberry harvest, “For Pickers, Blueberries Mean Easier Labor But More Upheaval.” The report focused on a migrant farmworker family who followed the harvest from Florida to North Carolina, and then continued on to Michigan. Benito Santiago spoke with reporter Dan Charles about his family’s journey. His family made the difficult and often risky travel to from Florida to North Carolina’s blueberry harvest because, even though the season is brief, it is profitable and it is one of the easier crops to harvest. But Benito is also aware of the burden the migratory lifestyle has on his family, especially the children. Children learn and play at one of our centers while their parents work in the fields. Children from migrant farmworker families with a disrupted education, like Benito’s children, oftentimes fall behind in their studies and struggle to catch up more and more as each year passes. Just as a child is starting to settle into a new school with new teachers and new friends, it is time for the family to move again. This story underscores why our migrant farmworker families need our support. As it has for the last 30 years, East Coast Migrant Head Start Project continues to provide continuity in services and stability for the children of migrant farmworker families through their Migrant and Seasonal Head Start program. ECMHSP programs serve farmworker families by offering dual-language early childhood education for their children from birth to age five, and classes designed to enhance parents’ understanding of the public school system. ECMHSP equips students with the knowledge and skills they need to enter kindergarten, and empowers parents to take an active role in the education of their children. You can learn more about the high quality and comprehensive services provided and the farmworker families we serve by seeing this video, a part of the series American Graduate. What makes ECMHSP truly special is our ability to overcome the many challenges we face to meet the unique needs of Migrant and Seasonal Head Start eligible children and their families. The farmworker families we serve are mobile, live in hard-to-reach rural areas, earn extremely low wages, and work long hours every day. Often times, farmworker families depend on our Migrant and Seasonal Head Start centers to provide healthcare services and treatments, transportation costs, and nutritious meals for their children. ECMHSP operates 38 Migrant and Seasonal Head Start centers along the East Coast, from Lake Okeechobee, Florida, to Lake Erie, Pennsylvania. As a child moves from one of our center service areas to another center service area, we are able to access information on the children’s educational progress, immunization and health records, and family information to ensure the continuation of services and support. ECMHSP also maintains communication with the families served at our centers as they move up the East Coast so that servces are shaped around their needs. Benito Santiago was able to buy a house in Bladen County, North Carolina. His children will be able to attend the same school year round with the same teachers. But many families will continue to make the trek across America to provide us with the fresh fruits and vegetables we enjoy each day. And ECMSHP will be here to give their children a safe place to learn and play. To find the nearest ECMHSP center, please visit our website: www.ecmhsp.org. This week, National Public Radio (NPR) aired the investigative report, “In Florida, Strawberry Fields Are Not Forever.” This report is part of the ongoing series by NPR, in collaboration with ECMHSP, focusing on our farmworker families and the work they do providing America with a safe and secure source of fresh fruits and vegetables. In this story, reporter Dan Charles spoke to farmworkers who describe the back-breaking labor of the strawberry harvest in and around Plant City, Florida. There, farmworkers work long days under the hot sun in hopes of making enough money to feed their families. Farmworker parents, like Bernarda Chavez, soon will pack their belongings and move their families up the East Coast, following the labor contractor to the next harvest. ECMHSP parent work long days in under the hot sun during the strawberry harvest. The farm fields are no place for young children. When young children accompany their parents into the fields, they are exposed to the many hazards of agricultural work, such as pesticides, heavy machinery, and extreme weather conditions. They need a nurturing, safe place where they can play and learn. In the coming weeks and months our Head Start centers in Alabama, South Carolina, North Carolina, Virginia, Pennsylvania and New Jersey will open their doors to our migrant farmworker families ensuring that young children do not accompany their parents to the fields. Our dedicated employees will open their hearts to these same families as well. As spring arrives, we celebrate the contributions of farmworker families who miraculously feed this great nation. We also celebrate our dedicated employees who make minor Head Start miracles happen each and every day. Office of Head Start’s Colleen Rathgeb and ECMHSP’s Parksley Center Director LaShundra Weeks with children from farmworker families. Today, National Public Radio (NPR) aired the investigative report, “Guest Workers, Legal Yet Not Quite Free, Pick Florida’s Oranges,” in its show, Morning Edition. This report is part of a larger series by NPR, focusing on our farmworker families and the work they do providing America with a safe and secure source of fresh fruits and vegetables. Large agribusinesses and small family farmers alike are increasingly making use of the H2A guest worker program. For me, this development is unfortunate. We are a country made stronger, better, and richer by new immigrants. We are not a country of guest workers. This year, for the first time ever, farmworker parents were unable to travel to participate in ECMHSP Policy Council meetings for fear of losing their jobs to H2A guest workers. It should not be this way. Today’s NPR story is enlightening and I encourage you to give it a listen. I also hope you didn’t miss the earlier stories completed by NPR in the fall of 2015. In September 2015, staff from the Field of Dreams Migrant Head Start Center operated by PathStone Corporation, a friend and delegate agency partner of ECMHSP, accompanied NPR reporter Dan Charles into the apple orchards of Adams County, Pennsylvania to interview migrant farmworker families. The investigative radio report, “Inside the Life of An Apple Picker,” was aired nationally late October and featured ECMHSP parent Jose Martinez and his family. 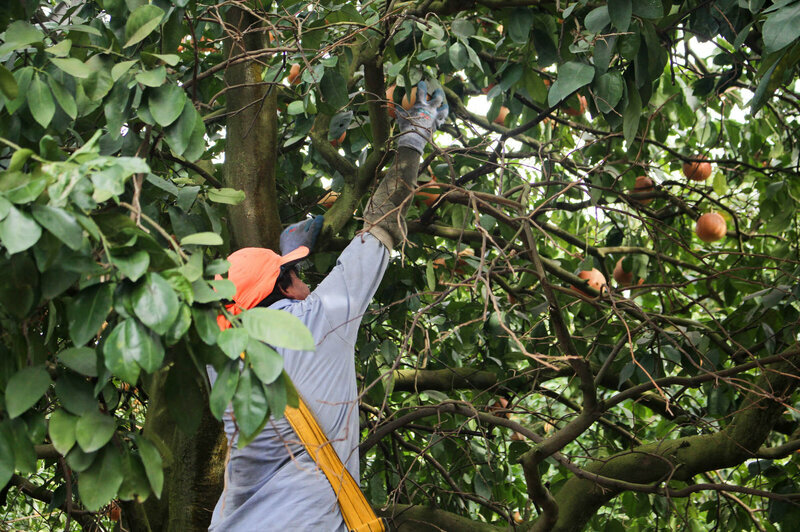 In the story, Jose describes the challenges his family faces as they migrate from Florida to the apple harvest in Pennsylvania, and the stability ECMHSP has provided his children. Just in time for the holidays, ECMHSP staff from the Faison and Fountain centers accompanied Dan Charles into North Carolina’s sweet potato harvest. The story, “Behind Your Holiday Sweet Potato Dish, Hard Work In The Fields,” was aired on national radio at the end of November and featured ECMHSP parents Nabor Segundo and his wife Rosalia Morales. Nabor invited listeners into his home, where he shared his family’s story, and into the fields as he performed the back-breaking work behind the Thanksgiving staple. ECMHSP will continue to create media opportunities that will allow farmworker families to share their contributions to their communities, as well as the needs of their families across the East Coast.